The festival finished last night in Angra so we will now get some earlier nights! 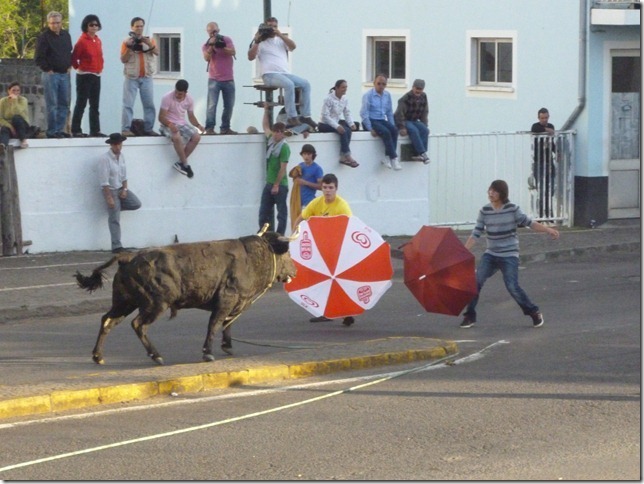 Yesterday was their last ‘Bull in the street’ event, it was in some random bit of town with a square in the middle and cross roads – you could tell as you got close as shop windows had been boarded up and barracades around little alleyways etc with people hiding behind them. 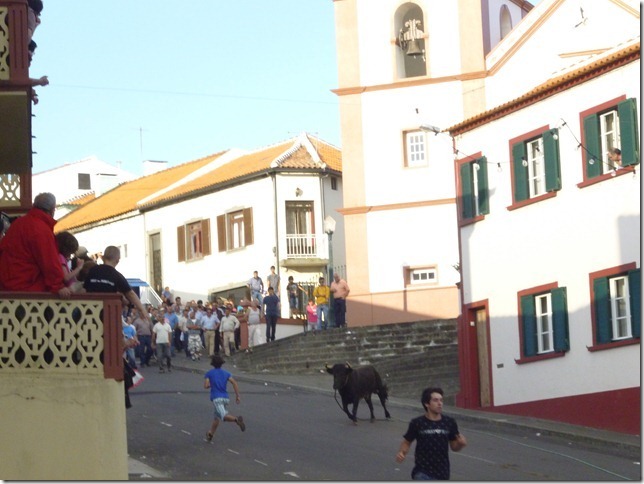 Bull then went trotting (or charging) off down another road so we went to the central square to talk to some locals – all of who had lots of advice on ‘not getting hurt’ – talking to one guy (who maybe had too many beers) – he was keen to tell us the tips - ‘look at the eyes of the bull. . . the bull follows where the eyes go. . . etc etc’. 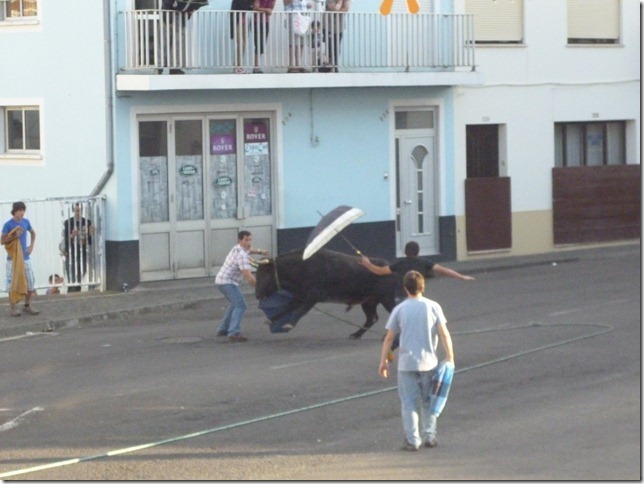 At that point the Bull re-appeared after it’s stroll - eyes pointed to us, we were all stood around the crates that the bulls get loaded in and out of, the locals said that squeezing through the 50cm gap between the crates and the building next to them and into the alley beyond was the safest place to go, rather than running off down the street or piling over walls – hence we were staying within a few yards of that gap. 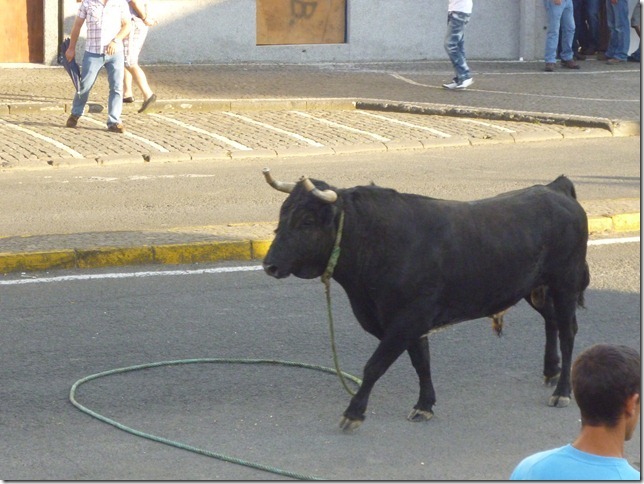 The bulls followed its’ eyes and it came in our direction so about 7 people all tried to squeeze through said small gap together – there is no room for politeness when a ton of bull is bounding over. Bulls seem to like umbrellas – a few lads were waving open umbrellas and the bull would charge these – surprisingly no-one (including the bull) was hurt but it looks pretty risky and after about 20 minutes the bull was loaded back into his box – that was interesting since we were stood on top of the bull boxes at the time having worked out that it was both safe here and you could see what was going on (we figured there was no way a bull could tip over a metal box containing another bull). The whole thing reminds me a bit of being 10 years old again and playing in the farmyard next door to our house and trying to get chased by cows, dogs etc. 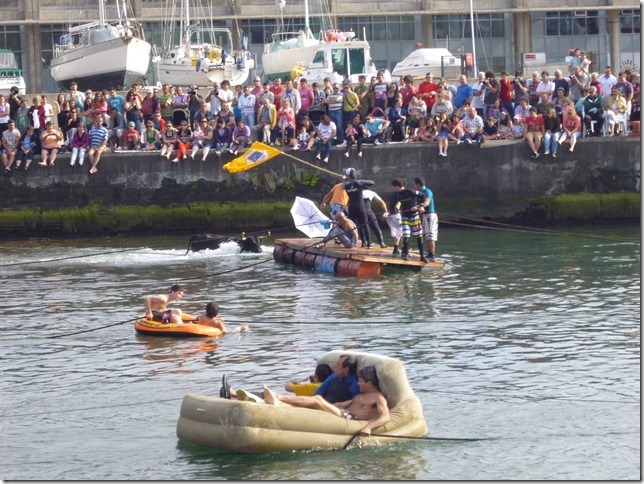 – the Azoreans have just turned this into a national summer pass-time. You can buy videos of ‘1001 funniest Butts’ and such like with people getting trampled on, or propelled into the air, losing trousers and such (in fact – we even saw Al feature on this video) – so, as well as enjoying running away and hiding, the Azoreans also like to see people getting caught. Below - From the other day – Bull just before it jumped, landing all four feet on top of the raft and sending the occupants scattering into the water, the bull stood on the raft for about 10 seconds before jumping off for a drink. on the raft rhey’re holding onto the lines to haul boats up the slip.